Bassmaster Elite Series pros don’t even want to think about Lake Murray this week. Right now, their heads are into cracking the code of West Point Lake bass. They’re busy practicing May 2-4 on the Georgia-Alabama border lake for the May 5-8 Pride of Georgia competition. Lake Murray is a Saluda River impoundment northwest of Columbia. This is Davy Hite country. Hite lives in the South Carolina town of Ninety Six; he used to live in Prosperity. A Murray angler all his life, he’s acknowledged as the Elite Series field’s expert on the fishery. Yet Lake Murray is also Fred Roumbanis and Alton Jones country. They don’t live anywhere close to the impoundment; their connections to the lake are as victors in Bassmaster tournaments there. Roumbanis, a California native who now lives in Oklahoma, won the 2008 Elite Series stop there. Jones, of Waco, Texas, won a 2000 Megabucks event on Murray. Roumbanis’ Elite Series year started a bit cooler but is heating up. After three Top-50 cuts (29th, 27th, 34th), he landed a Top-12 cut with a fifth-place finish in the April tournament on Toledo Bend. After West Point, he’ll be back on the fishery from which he pulled 66 pounds, 13 ounces of bass in May 2008 for his second Elite Series-level win. Filled by 1930, Murray is an older impoundment that’s seen change, including two structural updates to its dam. The lake is about 41 miles long, but the shoreline measurement tells more of the fishing story: 650 winding miles of banks. The bass are all largemouth — no smallmouth, no spotted bass. He said herring move shallow at night to spawn. The activity continues into the wee hours of the morning, so the first hour of Elite Series competition — as the sun rises over the trees — will be crucial for the pros on a herring pattern. But the lake’s prolific striper population also will be after herring, so anglers will have to wade through some stripers. “I believe the successful pro will have to have at least three working patterns,” he added. Those patterns could be just about anything this time of year. A few bass are still spawning, Lown said, but many have moved offshore. The lake’s vegetation this year is non-existent, he contends, so shallow-water patterns are likely to be centered on docks, brush and wood. The lower lake holds the clearest water, so the pros will be looking for a little wind and cloud cover there. The water is more stained in the lake’s upper regions — increasingly so into the river and feeder creeks — so bluebird skies aren’t likely to be such a liability up there. * Also at stake: Besides a piece of the Top-50 payout, anglers will compete for points that count toward winning the 2011 Toyota Tundra Bassmaster Angler of the Year title, and for qualifying for the postseason — each $100,000 competitions within themselves. Also, the Top 28 in points at the end of the season will qualify for the 2012 Classic. * When: May 12-15. Anglers will be allowed three days of official practice, May 9-11, before the four-day competition begins on Thursday. 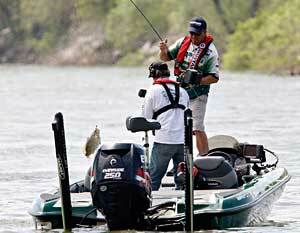 * The cut: The 99-angler field will compete the first two days, then be cut to 50 for the third day. The fourth and final day — Sunday, May 15 — will be a contest between the 12 pros who make the final cut. * Fan festival on site: The Evan Williams Bourbon Sampling and Prize Giveaway, Toyota Kids Casting Contest and Toyota angler silkscreen T-shirt giveaway, Mercury Power of Champions Tour, Yamaha S.H.O. Demo Tour, demonstrations of the latest baits and techniques on the Berkley Demo Tank, and Bass Pro Shops Kevin VanDam Prize Package Sweepstakes are on tap. 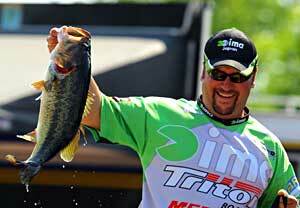 For a full list of the fun, check out the Attend pages of Bassmaster.com.